Catering to UKHASnet, RF Mesh Networking, and other embedded hobbies! 868MHz 100mW FSK ISM Transceiver Module. 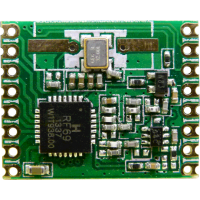 The HopeRF RFM69HW is the main radio module used in th..
1st Gen EtnaBoard PCB. Has footprint for LPC812 and RFM69HW, makes it easy to solder up a UKHASnet n..
Third revision of a through-hole AVR UKHASnet Board. Can be used as a Sensor, Repeater or Gateway.Mo.. This board is designed to be mounted on a Pi A+/B+, Pi 2, or Pi 3. It provides a footprint for an RF..